Abcam’s Insulin in vitro SimpleStep ELISA™ (Enzyme-Linked Immunosorbent Assay) kit is designed for the quantitative measurement of Insulin protein in Human serum and plasma (heparin). Insulin is a highly conserved, secreted hormone essential for glucose metabolism. Produced by pancreatic beta cells, proinsulin is proteolyzed into an A and a B chain, which form a 6 kDa mature protein. Basal levels of insulin are continuously delivered into the bloodstream, and additional levels are secreted proportional to food ingestion. Insulin secretion is highly regulated, and dysregulation of insulin production or sensitivity results in Type 1 diabetes mellitus or Type 2 diabetes mellitus, respectively. Our Abpromise guarantee covers the use of ab200011 in the following tested applications. Example of Insulin standard curve. Background-subtracted data values (mean +/- SD) are graphed. Titration of Human serum and Human plasma within the working range of the assay. Data shown for serum is from an individual donor with high endogenous insulin levels. Data shown for plasma is from a pooled (n=50) sample. Background-subtracted data values (mean +/- SD, n = 3) are graphed. Insulin levels in individual healthy donors. 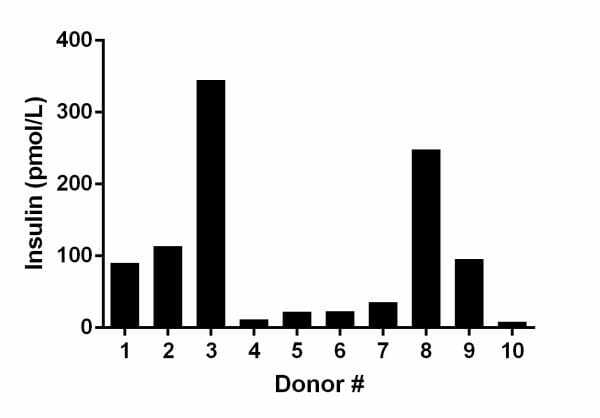 Ten individual healthy donors were evaluated for the presence of Insulin in serum using this assay. The range was from 11.8 – 345.1 pmol/L, with an average of 99.4 pmol/L. Health history and dietary status of donors were unknown. Publishing research using ab200011? Please let us know so that we can cite the reference in this datasheet. The human insulin ELISA kit (ab200011) is easy to work with and reproducible. We used the kit with insulin-secreting human cell lines following the manufacturer's protocol. Cells were treated with glucose to detect insulin secretion and cells were lysed to detect the insulin content. The kit worked perfectly when detecting high content of insulin. However, when the insulin content is low in the samples, more repeats may be needed as the standard curve at low concentration was slightly non-liner and variable in the three repeats we conducted. Overall, the kit works well in detecting insulin and we are pleased with the results.